A Digital Signage system deployed at the televisions in the public areas of Masjid AlSalam is used to display weekly announcements as well as paid advertisements (ads). Any revenue generated from the ads goes into the general fund for the masjid. If you have a business that you would like to advertise on the masjid TVs, please refer to the terms and conditions for advertising on this system. For additional details, or to purchase advertisement space, please send an email to [email protected]. Ads are rotated on the TV displays in a non-stop loop. The cost presented below is based on the length of time the ad will remain on display before it is replaced by the next ad in the queue. Monthly costs shown above are based on a 6 month contract, paid in advance. The 6 month period always starts from January 1st and July 1st and ends on June 30th and December 31st, respectively. Contracts starting outside of January and July will only need to pay for the months between the contract start month and the end of the appropriate contract period. Contracts will renew on January 1st and July 1st. The full 6 month amount needs to be paid before these dates. There is a one-time cost of $100 to create a flyer (advertisement graphic) if one is not provided by the advertiser. There will be no refunds provided. 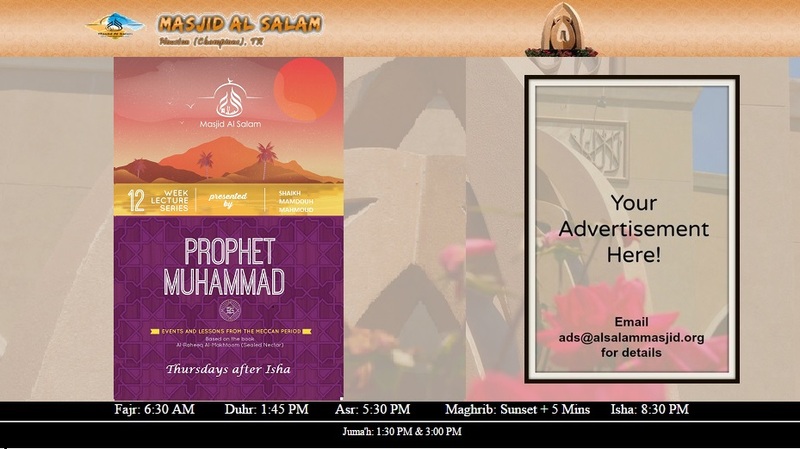 The ad graphic provided by the advertiser is subject to review, as well as any required cosmetic or content related changes, by the masjid administration. Any required changes must be incorporated into the graphic by the advertiser. Alternatively, a one-time fee of $100 can be paid to the masjid advertisement team to make said changes. There are currently three televisions in the public areas of Masjid AlSalam – two near the men’s prayer hall entrance and one in the entrance to the women’s section of the masjid. The monthly costs specified above are subject to an increase if additional televisions are added to the system. The frequency with which the ad image will be displayed is dependent on the total number of ads queued up in the system at that time. At present, the aim is to limit the system to no more than 20 ads. This is subject to change. Copyright © 2019 Masjid AlSalam. All Rights Reserved.